Running a small business can be tricky. You want to keep your employees busy without underbidding jobs. But with inflation, the cost of living rising, and the hits your company may or may not be taking over healthcare, it may be time to increase prices. In fact, 80% of those surveyed in our 2018 Green Industry Benchmark Report said they plan to raise prices this year. Here are a few tips for breaking the news to your customers and a few remedies to take some of the sting out. Before you go around jacking up prices, take time to evaluate your current services to see which have been efficient and which have not. Know your overhead and the cut it takes from your revenue. It may be time to let a particular service go all together if you’re not making big enough margins or any at all. Back in 2011, video service provider Netflix decided to split its streaming and mail order video service into two separate services. This split caused some customers to bear a 60% price increase to keep the service they were previously buying. Uproar ensued, dropping Netflix's stock price and eventually causing CEO Reed Hastings to apologize for his “arrogance” and for failing to adequately explain the price hike. So it starts with communicating any changes to all of your employees and in turn they can join you in passing along this price hike to the customers. One thing customers hate (as the example above showed) is getting a bill they weren’t expecting. Don’t wait till it’s time to bill your customers to introduce them to the new, more expensive you. Write them a letter or give them a call to let them know why your company needs to generate more income to continue to provide the quality service and materials they have come accustomed to. Your customers want to know what they’re paying for, so tell them, honestly and transparently. As long as your intentions are good, their response should be manageable. And it always helps to reassure them of your value.The last thing you want is your customers thinking that what you do is a commodity. If you’re worried about losing customers, as most of us are, one solution can be to create discounted packages. See which services you can bundle and complete on the same visit. 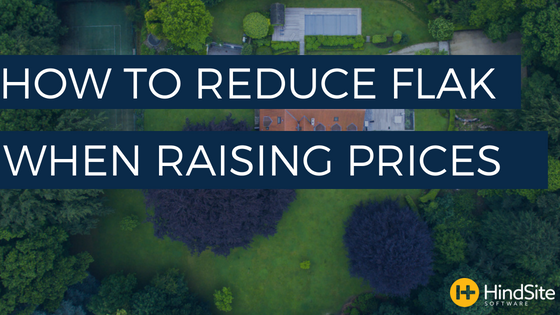 It may be possible to offer a reduced rate for bundled services due the fuel cost and windshield time involved in multiple visits to a property. You could also offer a reduced price for customers that agree to longer contracts. It may not be easy to sell your services at a higher rate but it may be necessary to stay buoyant. Before you rush to the price sheet and start making adjustments, make sure your business is running as efficiently as possible. If you can manage to hang on to your prices for the next season by cutting waste in your operation, you may just be able to keep an edge on the competition.